We strongly believe that the Danube river and its location in regard to Bratislava offers extraordinary opportunities for sustainable waterborne passenger transport and integrated transport solutions for our capital. We strongly believe that a shuttle ferry connecting the cities of Šamorín, Hamuliakovo, Čunovo and Bratislava can not only work as a component of Bratislava public transport networks - to considerably enhance efficiency, environmental performance, quality of life and comfort in the Slovakia busiest urban areas, they could also provide lifeline services for our communities and areas as well as revitalise their tourism potential. A territory by two self-governing regions, reaching up to ​50 km along the Danube, with appr 70 000 residents. 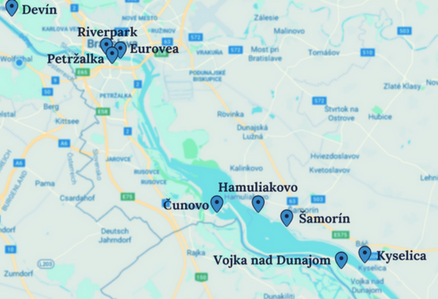 Connecting Devín, of Bratislava, Čunovo, Hamuliakovo, Šamorín, Vojka nad Dunajom and Kyselica. "A large number of commuters in Europe travel by road, creating bottlenecks, congestion and delays on Europe’s urban routes. ​less then 1500 cars daily.